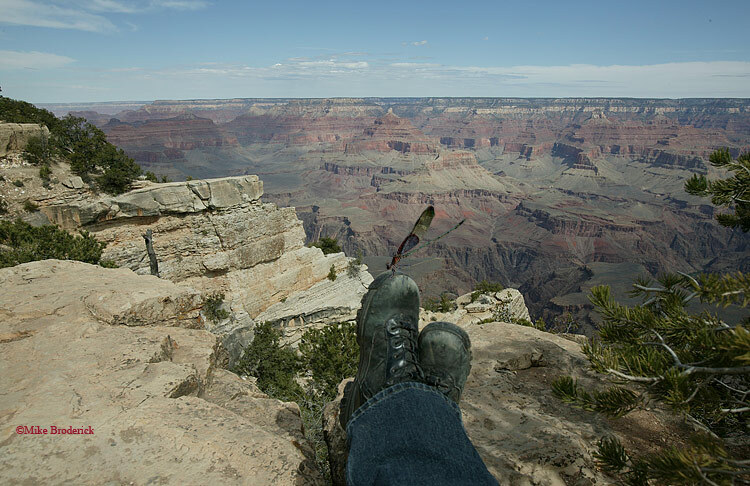 Rik's posting about the Reader's Digest cover photo fake (see this posting, and be sure to check out the photo that caused the furor in the link in my response) caused me to decide that I should do something similar during my trip to the Grand Canyon last week. In honor of the new digital age, I decided to commit my fraud with digital imaging, rather than by raiding my non-existent bug collection. I also found that to get a damselfly big enough to register against the Grand Canyon, I had to beef up his size, though he is still much smaller than those Triassic age dragonflies with the one-yard wingspans! I don't think American Rubyspot Damselflies occur in the Grand Canyon, but what the H*ll! Then it occurred to me as long as I wasn't bound by restrictions of species distribution, I should indulge my preferred photographic subject, snakes. Herewith, I give you the first known sighting of the South American Eyelash Viper in the Grand Canyon of Arizona, USA! At least his size is about right. Oops, I meant to include the link to Rik's original post.